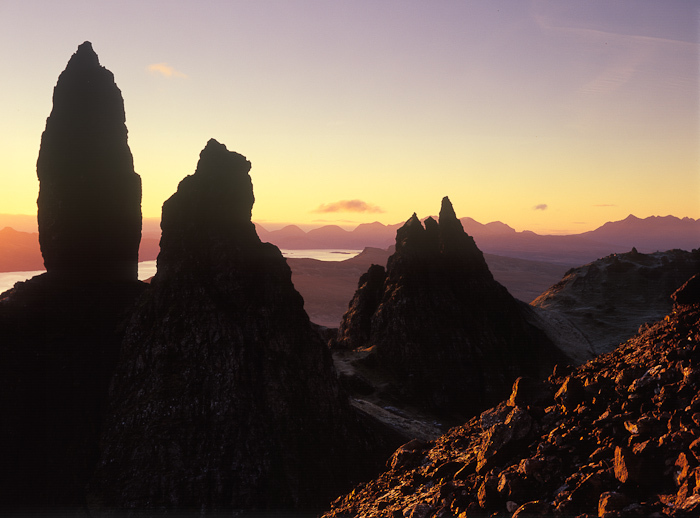 Taken a few minutes after the Old Man of Storr Dawn shot, this image shows the first light of sunrise hitting the barren landscape. By knowing where the sun would rise this morning, I knew I could keep the rock formations silhouetted to give them even greater prominence. I did not linger at this location as I was wedged at the foot of a cliff and the warming sun was loosening rocks, which fell down with alarming regularity. Photo © copyright by Graham Chalmers.